Egypt's antiquities ministry says the tombs were found under the mortuary temple of the Pharaoh Amenhotep II, who reigned from 1427 BC to 1401 BC. 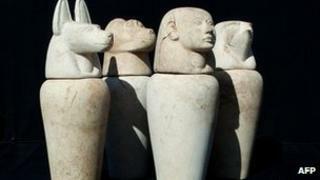 The ministry said remains of wooden sarcophagi and human bones were found inside the tombs. The figures - which have the heads of a human, a baboon, a jackal and a falcon - were believed to help the soul find its way to heaven.